This was the 8th broadcast of Shawa Gohan. Sawako was wearing a black jumper skirt over a white blouse with a large frilly collar, with small dots. Her hair was tie up in the back. Sawako read some mails from the viewers. Sawako said that she will read some mails at the restaurant too, so the studio part was shorter than in the previous broadcasts (less than 10 minutes). 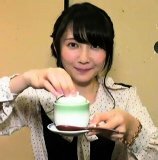 The video switched to show Sawako in Ikebukuro (one stop before Ohtsuka). She wanted to eat yaki shoronpo (xiaolongbao/dumplings), and she said this was the first time that she had any. Next the video switched to Ohtsuka. It didn't show Sawako walking around. She was wearing a brown coat with a white scarf. The restuarant that Sawako went to was Sushi Tsune Honten. It was a sushi store. Sawako was in a private tatami room, and she read some more mails. For sushi, Sawako likes engawa (flounder fin) and shellfish. She ordered several sushi, mostly shellfish. This restaurant also had other dishes (non-sushi), and Sawako ordered some of those too. Sawako read some more mails while eating. After a while, the video switched back to the studio. 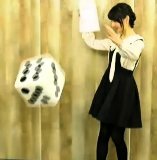 Sawako wanted to roll a small number, but she rolled a 4. 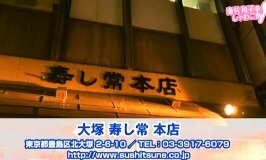 So the next stop was Nishi Nippori, and the broadcast will be 3/10. The members only broadcast was around 17 minutes. This video was just a continuation of the restaurant video. Sawako had ordered an additional crab salad. She read some more mails, and talked about Valentine's Day. 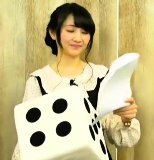 Sawako doesn't remember what she did last year, but previously when she had work on that day, she would give some chocolates to the staff. Since she doesn't like chocolates that much herself, Sawako doesn't go out and buy some for herself. Then she ate saikyou yaki (miso based fried fish). 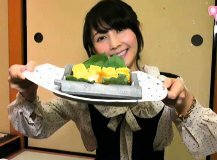 Sawako said likes the saikyou yaki bento from the store Kinbei. Sawako also ate roast beef nigiri and anago sushi. Sawako usually goes to kaiten sushi to eat sushi. Compared to that, there is a lot more rice in the sushi for this store. So it takes her a long time to eat one sushi. Sawako couldn't talk for about one minute as she was eating the sushi.